WASHINGTON, Oct 22 (IPS) - Despite media hype, missteps by federal health agencies, and apparent efforts by right-wing and some neo-conservatives to foment fear about the possible spread of the Ebola virus in the U.S., most of the public remain at least "fairly" confident in the authorities' ability to deal with the virus. The survey, which was conducted Oct. 15-20 by the Pew Research Center, found that about six in 10 respondents (61 percent) said they have "a great deal" or a "fair amount" of confidence in U.S. hospitals "to diagnose and isolate possible cases of Ebola," compared to 38 percent who said they have little or no confidence. 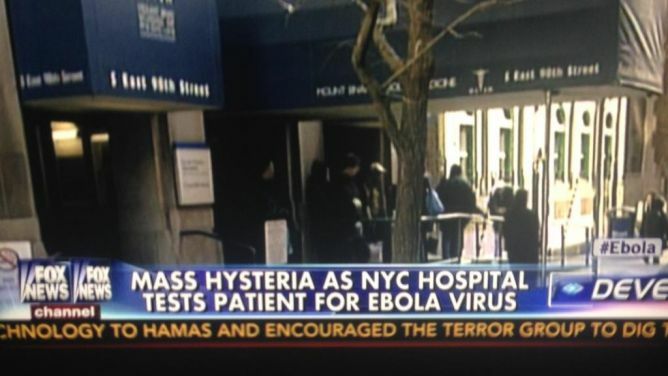 And 54 percent – only three percent lower than in another Pew poll taken in the days that followed Thomas Eric Duncan's much-publicised hospitalisation -- said they have a "great deal" or "fair" amount of confidence that the federal government will prevent a major outbreak of the deadly disease here. The survey, however, found major differences in perception of the threat depending on the respondents' political affiliations. In early October, for example, a third of self-identified Republicans said they were at least somewhat worried that they or their family members would be exposed to the virus. That percentage has since increased to 49 percent. The loss in confidence in the government's ability to prevent a wider outbreak has grown – albeit by not as large a percentage – among Republicans who tend generally to be ideologically more distrustful of government than Democrats or independents on most issues. With the approach of mid-term Congressional elections in just two weeks, however, some Republican politicians and right-wing and neo-conservative publications and commentators appear to be deliberately fanning fears of Ebola's spread and the government's purported inability to deal with it, even conflating the virus's prominence with the threat of terrorism and, specifically, the Islamic State of Iraq and the Levant (ISIL). Indeed, the neo-conservative Weekly Standard's lead editorial this week was entitled "Six Reasons to Panic", while the Washington Post featured an op-ed by Marc Thiessen, a right-wing Republican commentator and fellow at the American Enterprise Institute (AEI), depicting a "nightmare scenario" in which "suicide bombers infected with Ebola could blow themselves up in a crowded place – say, shopping malls in Oklahoma City, Philadelphia and Atlanta – spreading infected tissue and bodily fluids." Commentators on Rupert Murdoch's Fox News have conjured similar scenarios. As noted by The New Republic this week, "a growing body of literature in psychology suggests that feelings of fear make people's political outlook more conservative." The Ebola pandemic, which, according to official figures – unofficially, the estimates run much higher – has caused the deaths of well over 4,500 people in Liberia, Sierra Leone, and Guinea since its outbreak last spring, was almost entirely ignored by the mainstream media here until the end of July when two U.S. missionaries were infected and flown to the U.S. for treatment. But it shot to the top of the news agenda with confirmation that Duncan, a Liberian who had flown to the U.S. for his son's high school graduation, was admitted to a Dallas hospital Sep. 30 and tested positive for the virus. He died Oct. 8. Within a week, two nurses who had treated him also tested positive and are currently being treated in specially equipped and trained hospitals. Since Duncan's hospitalisation, Ebola has received more attention on three network nightly television news programmes – the single biggest source of information about international and national events for the U.S. public -- than any other story, accounting for almost one third of total broadcast time over the past three weeks, according to Andrew Tyndall, publisher of the authoritative Tyndall Report which has tracked network news for 25 years. He told IPS he had "very mixed feelings" about the networks' coverage. "On the one hand, it is a genuine crisis in the countries where's it's happening, and therefore it deserves all the attention it can get," he said. "On the other hand, the nature of that attention is inappropriate, misleading, and scare-mongering in that it is so disproportionately focuses on the very low level domestic threat (Ebola poses), as opposed as to the actual crisis in the three West African nations." What applied to the three networks – CBS, ABC, and NBC – applied much more to the main cable news stations – Fox News, CNN, and MSNBC – whose coverage was, if anything, more sensational despite efforts by its resident health experts or guest epidemiologists to rein in the rampant speculation. One CNN anchor, for example, offered up a similar scenario as the one described by AEI's Thiessen, noting that "All ISIS would need to do is send a few of its suicide killers into an Ebola affected zone and then get them onto mass transit." Such panic-provoking commentary has naturally bolstered Republican efforts to generate a sense that the world was spinning increasingly out of control due to the "weakness" and incompetence of President Barack Obama and his administration, a theme that was made somewhat more credible by over-confident statements before the two nurses' infection by administration officials, notably the head of the Centers for Disease Control and Prevention (CDC), about their ability to "stop in its tracks in the U.S."
Backed by right-wing media, Republican lawmakers and candidates have demanded that the administration impose a ban on civilian air travel to the U.S. from the three West African countries – a position favoured by nearly three out of four respondents, according to recent polls, despite strong opposition by epidemiologists and other public-health experts who have warned that such a step will make it more difficult to track Ebola's victims and those with whom they come in contact. Obama sought initially to appease those demands by ordering temperature checks at five of the most important U.S. international airports for incoming passengers whose travel originated in the three West African countries. Faced with the growing political pressure, he expanded that order Tuesday by requiring passengers flying from those nations to enter the U.S. through one of those five airports. Republican lawmakers, however, insisted that that was insufficient and are reportedly preparing legislation that would suspend U.S. visas for citizens of the Ebola-affected countries. Despite the public's concern about exposure to Ebola, large majorities of respondents, including 85 percent of Democrats and 70 percent of Republicans, said they supported the administration's efforts to fight the virus in West Africa. Those efforts include sending an estimated 3,000 U.S. servicemen and women to build treatment units and training facilities for health workers, and provide logistical support and transport for needed equipment and personnel, as well as more than 100 health specialists from the CDC and other agencies.